Six families in Sallisaw were left homeless Wednesday evening when a fire broke out at Royal West Apartments on Ruth Street. Sallisaw firemen contacted the Red Cross and Red Cross personnel were on their way to make other living arrangements for the families and to provide them with food. 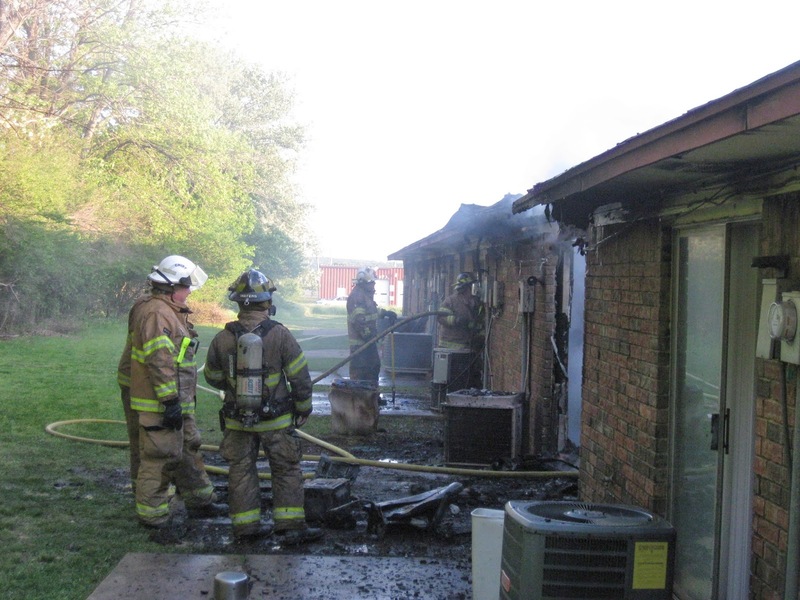 At least two apartments were destroyed in the fire and four others were badly smoke damaged. No one was injured and all the families and their pets were able to escape without injury. The fire erupted at about 7 p.m. and Fire Chief Anthony Armstrong, above left, said the cause of the fire was still under investigation. The fire began in Apt. 5, where Jimmy and Mary Hunt live. They believe a candle may have started the fire according to what they told apartment manager Brenda Adams. The apartment complex is owned by Lynn Bolton, who arrived shortly after the fire began. Adams said, "Everybody's safe. That's all I'm worried about. Material things can be replaced. No one died and even the animals are all safe." The families were told that when the firefighters had the apartment building safe, they would be allowed to get what they could from the smoke-damaged apartments. 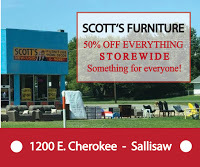 As of 8:15 p.m. all of Sallisaw's firefighters and fire trucks were still on the scene. Stay tuned to KXMX for the latest news, or visit www.kxmx.com. Clean Line Energy is looking for a route to transmit wind power from western Oklahoma to the Tennessee area and is holding a meeting at 6:30 p.m. Thursday at Belfonte School, north of Muldrow, to meet with property owners and hear their concerns. Company spokesman, Phillip Teel, the company's Oklahoma manager, said there is no definite route yet. An Environmental Impact Study must be done and the route approved by the Department of Energy (DOE). The DOE will most likely suggest a route later this year or early next year, and other agencies are studying the environmental and local impact of the proposed route. Stay tuned to KXMX for the latest news, or visit www.kxmx.com. April 2015. . .that’s when the new Sallisaw Sports Complex is expected to be ready for play. City Manager Bill Baker said Sallisaw City Commissioners unanimously approved bids at a special meeting Wednesday morning to provide water to the complex and for lighting. 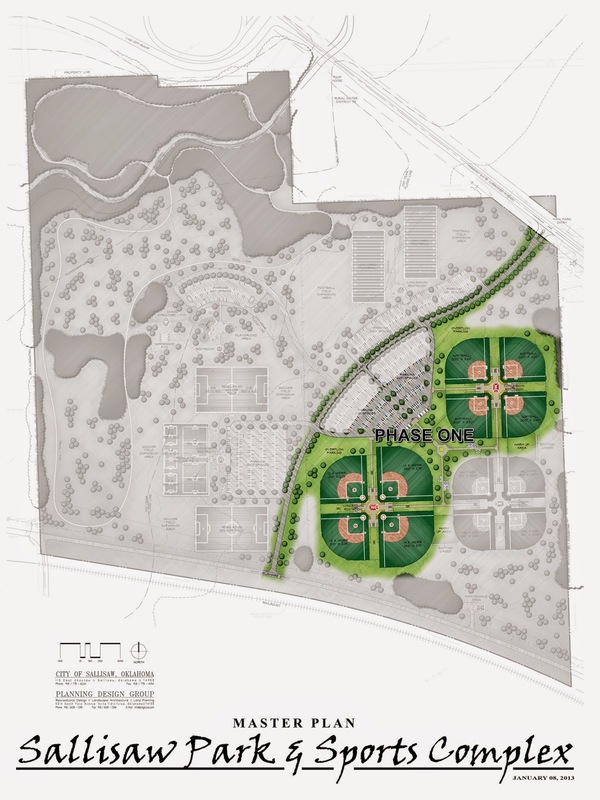 Construction is to begin May 12 on four baseball fields and four softball fields. Seven of those fields will be lighted, and the city is searching for funding to light the eighth. Baker said the city commissioners approved a contract with LLG Construction Inc. of Oktaha, for $339,330 to build the 12-inch waterline down Delaware Street to the complex. The LLG bid was the lowest. The commissioners also approved an agreement with Hawkins-Weir Engineers of Van Buren for administration and inspection of the water line. Baker said the $3.9 million sports complex project contract is for 300 days and the complex should be done, weather permitting, by March or April next year. Stay tuned to KXMX for the latest news, or visit www.kxmx.com. 36 year old Edward Branch Jr, an escapee from the Haskell County Detention Center, was arrested this morning by the Sallisaw Police Department after being spotted around mile marker 310 on Interstate 40 near Sallisaw. Branch escaped from the Haskell County Detention Center on April 22, 2014 around 1:00am. 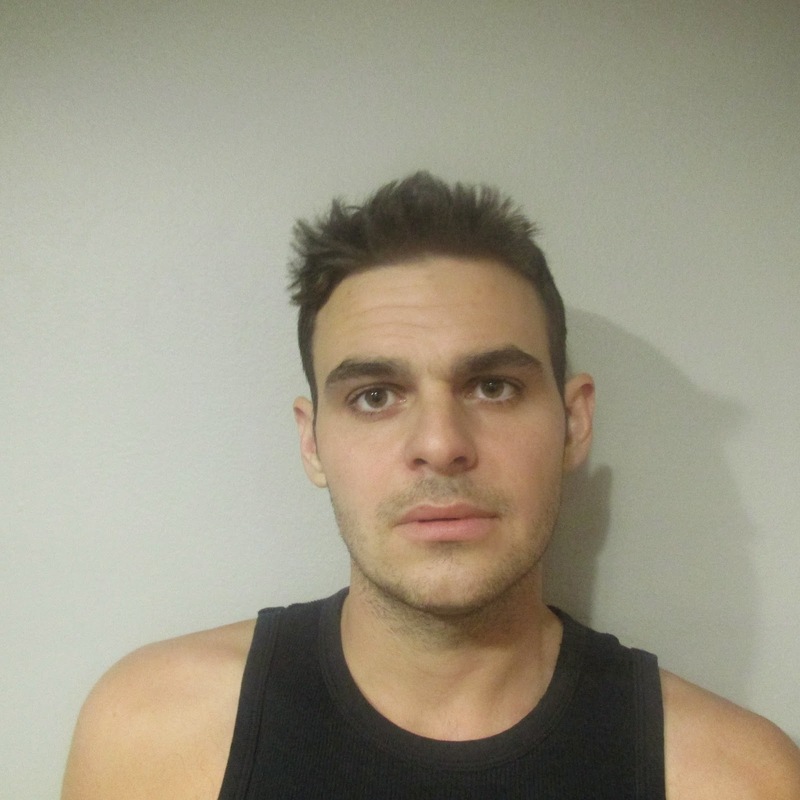 He is currently in the Sequoyah County Jail awaiting extradition to Haskell County. For more local stories visit our website at www.kxmx.com. 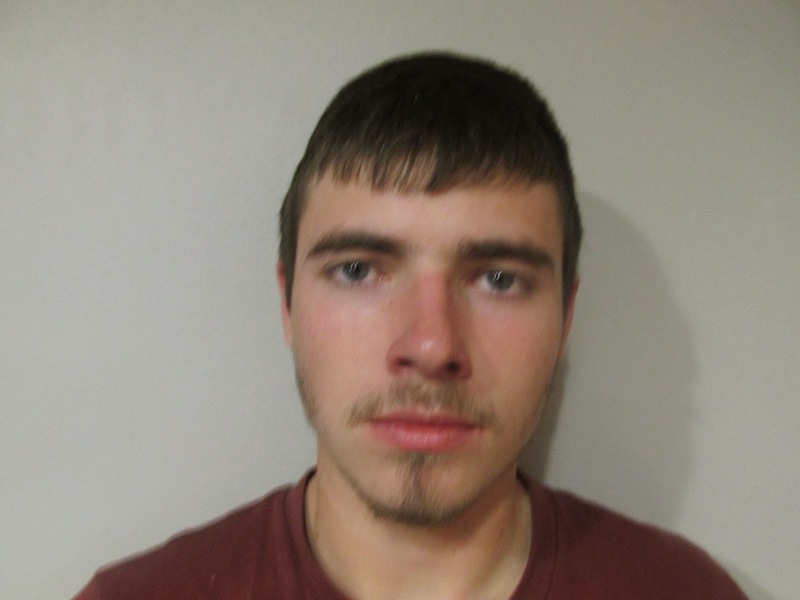 Kyle Lewis Brannon, 18, turned himself in at the Sequoyah County Detention Center Wednesday on a misdemeanor warrant that accuses him of destroying evidence at the scene of an all-terrain vehicle (ATV) wreck and obstructing law enforcement. Brannon was accompanied by a bondsman, was booked and released immediately on a $2,000 bond. According to the warrant affidavit filed in Sequoyah County District Court in Sallisaw, Brannon and another teen were called to the ATV wreck scene by Angela Gray, 38, who told investigators she was a passenger on the ATV which was driven, she said, by Christian Mayberry, 16, of Muldrow. Brannon and the other teen, who has also been arrested, took a cooler and beer from the scene, and may have even moved Christian Mayberry, 16, of Muldrow who was seriously injured in the wreck. Mayberry was thrown about 12 feet from the ATV and lay unconscious for at least three hours before being found. He suffered a severe brain trauma in the wreck and has been in rehabilitation ever since trying to recover his former life. Stay tuned to KXMX for all the news, or visit www.kxmx.com. Arty Allen Farris, 19, entered a not guilty plea to a first degree murder charge Wednesday in Sequoyah County District Court in Sallisaw. Farris was charged Tuesday for the death of Jason Stone, 22, on the night of April 4. Farris told investigators that Stone and two others were at Farris’ home in Marble City, drinking. Farris said Stone was bullying him and hit him on the lip. Farris said he then got a rifle, loaded one bullet, and shot Stone when he called him a vulgar name. Farris told investigators that he then spilled gasoline around the house and set it on fire. The state medical examiner reported Stone died of smoke inhalation. Farris’ case was put on Judge Larry Langley’s disposition docket on June 25. Stay tuned to KXMX for the latest news or visit www.kxmx.com. Dr. Matt Bauer, center, owner of the Sallisaw Chiropractic Clinic, and his wife, Jamie, accept the Business of the Month Award from Gary Winton, left, Sallisaw Chamber of Commerce president. The award was presented Wednesday at the monthly chamber luncheon meeting. At the same meeting, Winton announced the chamber was donating $1,000 to each of three education organizations. He also reminded members that the chamber's popular Diamond Daze festival will be held June 5 through 7 at the Sallisaw High School campus. The Sallisaw Chamber of Commerce donated $1,000 for teacher scholarships to the Sallisaw Education Foundation at the chamber's monthly meeting Wednesday. Chamber President Gary Winton, left, presented the check to, from his left, Kim Girdner, Scott Farmer, Erika Martens and Dale Phelps, who represented the foundation at the presentation. Dr. Curtis Shumaker, right, accepts a $1,000 check for scholarships from Gary Winton, Sallisaw Chamber president. The donation to the Indian Capital Technology Center was made at the chamber luncheon Wednesday. Carl Albert State College Sallisaw Campus received a $1,000 donation for scholarships from the Sallisaw Chamber at the chamber's monthly luncheon Wednesday. Presenting the donation is Gary Winton, left, chamber president. Accepting are, from Winton's left, Garry Ivey, CASC president; Dr. Kathy Harrell, CASC Sallisaw Campus vice president; and Gary Schaefer and Buddy Spencer, representing the CASC Committee for Excellence. Dr. Faisal Khan of Sequoyah Memorial Hospital's surgery team, explained the surgeries and medical testing available to Sequoyah County residents at the Sallisaw hospital to members of the Sallisaw Chamber at the chamber's monthly luncheon Wednesday. Khan said the hospital offers state of the art proceedures and equipment. "We have all the tools to take care of the patient before, during and after surgery," he said. Stay tuned to KXMX for the latest news and updates, or visit www.kxmx.com. Late Tuesday evening emergency crews including the Oklahoma Highway Patrol and the Sequoyah County Sheriff's Department worked a deadly motorcycle crash on US Highway 59 south of Wildhorse Mountain in Sallisaw. Two riders were on the motorcycle at the time of the accident and one person was killed. According to authorities, the driver of the motorcycle was Jimmie Lovell, 72, from Muldrow. Lovell had allegedly been drinking at the time of the crash. The passenger on the bike, Peggy Sue Taylor, 63, was pronounced dead at the scene. Lovell was taken to a Fort Smith hospital with life-threatening injuries and is currently in stable condition. Lovell's blood was tested for alcohol at the hospital and it was determined at that time that he had been drinking. 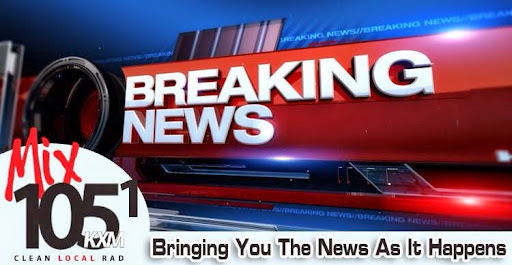 For more local news visit us at www.kxmx.com. Arty Allen Farris, who will be 20 years old on April 29, was charged with first degree murder Tuesday. The charges were filed at about 2 p.m. in Sequoyah County District Court in Sallisaw. Farris is accused in the death of Jason Stone, 22, of Sallisaw. Stone's body was found in Farris' burning home in Marble City on April 4, and his body sent to the Oklahoma medical examiner. Farris was arrested for the death on April 5, and released last week on a $25,000 bond. According to court records, Farris told investigators that he, Stone and two others were drinking beer and whiskey on the night and morning of April 4 and 5. He said Stone bullied him, called him names, and hit him in the lip. That's when Farris said he got his .243 rifle, loaded it with one bullet, and shot Stone. According to the charges, Stone died of smoke inhalation after Farris poured gasoline around the living room and bedroom of his home and set it on fire. The case was investigated by the Sequoyah County Sheriff's Department, the state fire marshal and the Oklahoma State Bureau of Investigation. Stay tuned to KXMX for the latest news, or visit www.kxmx.com. Jan Gonzalez, 60, of Muldrow surrendered to the Muldrow Police Department at 4:00 pm on Saturday, April 19th. Gonzalez had a warrant issued for her arrest on suspicion of manslaughter. According to reports, Gonzalez and Justin Clinton, 29, also of Muldrow were involved in an accident on September 29, 2013 in which Gonzalez allegedly ran over and killed Clinton, a pedestrian, with her vehicle. Blood tests taken on the night of the incident tested positive for controlled substances. Gonzalez was also cited that night for driving under a suspended license. 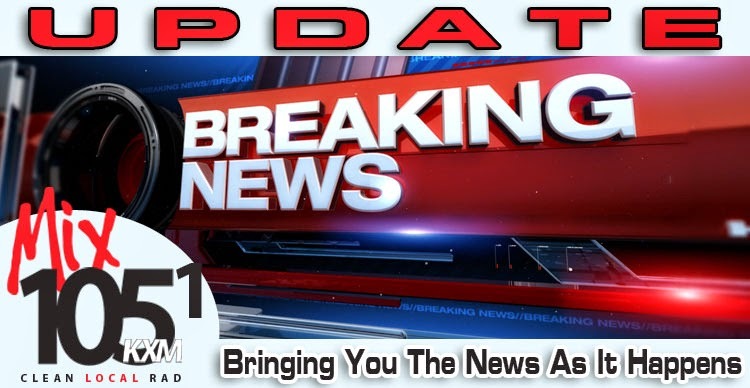 For the latest news stay tuned to KXMX 105.1 or visit kxmx.com. A candidate for District Judge, District 15, Office 3, was stricken from the ballot Monday by the State Election Board. Joseph Josiah Stone, 53, of rural Stilwell, filed last week with the state board to oppose District Judge Jeff Payton, above, in the state election. But Payton, 50, also of Stilwell, challenged the eligibility of his opponent, and the election board agreed, voting to remove Stone. That means Payton is unopposed and will remain in office. In his challenge Payton said Stone has a misdemeanor conviction, and did not have the four years experience as an attorney or judge which is required for the post. Stay tuned to KXMX for the latest news, or visit www.kxmx.com. Cherokee Nation Businesses will hold a ground breaking at 11 a.m. Tuesday for a new casino and hotel in Roland. The new facility will replace the current casino, but that casino will not be closed. The new facility will be built around the one already open. Janelle Fullbright, Cherokee Nation Tribal Council member who represents a portion of Sequoyah County, said the new entertainment venue will be built in three phases, beginning with a new casino, followed by a new hotel and then an events center. The new 170,000 square foot facility will offer 850 electronic games, table games and a private poker room. Two restaurants, a grab-and-go cafe and a buffet, will be offered to guests. The hotel will feature six stories and will be built as a resort featuring 120 rooms along with the convention center. It is expected the project will be completed by the end of 2015, and bids for various parts of the construction are being sought by the Cherokee Nation on the nation's web site. Stay tuned to KXMX for the latest news, or visit www.kxmx.com. An arrest warrant was issued last week for an 18 year old Muldrow man accused of destroying evidence and obstructing an officer. The misdemeanor warrant is for Kyle Lewis Brannon, 18, shown above on the night of his arrest for public drunk on Sept. 1. According to the affidavit filed in Sequoyah County District Court in Sallisaw, Brannon and another teen tried to cover up the facts about an ATV wreck on Sept. 1 that left Christian Mayberry, 16, of Muldrow fighting for his life and trying to recover his former life. The information indicates Angela Gray, 38, at first told investigators that she was not involved in the wreck, but later admitted to being a passenger on the ATV with Mayberry. When the wreck occurred, Gray allegedly called for her son, who was close by, to help. The information alleges Brannon and the other teen, who has been arrested, tried to clean up the wreck and left Mayberry lying in a ditch. Two calls were made to 911 at about the same time, but when 911 dispatch called the phone number back, no one answered. The 911 call which led to authorities finding the site was made three hours later, according to court records. According to the affidavit, Brannon told investigators that an ice chest was hidden and beer poured on Mayberry in an effort to wake him up. Mayberry suffered a traumatic brain injury in the wreck, and has been in rehabilitation ever since. A 5K race will kick off at 8 a.m. April 26 from the Muldrow Veterans of Foreign Wars Post in Muldrow to raise money for the family. More information on Christian's recovery may be found on the Pray for Mayberry Facebook page. As of the time of this posting, Brannon was not in the Sequoyah County Jail. For the latest news, stay tuned to KXMX, or visit kxmx.com. 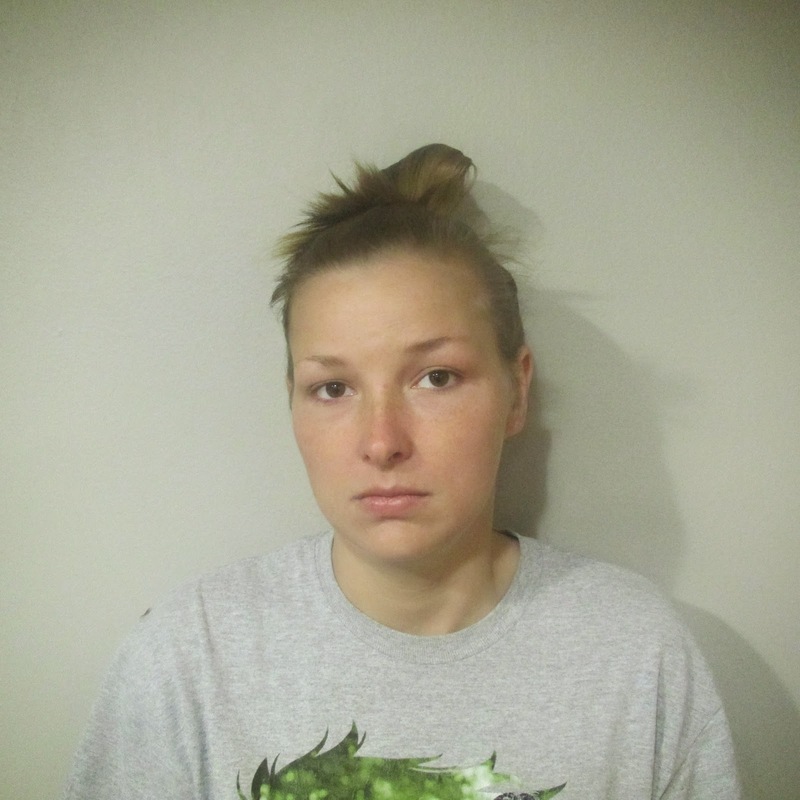 The mother of a 3-year-old child abuse victim, who was found to have both new and old burns and wounds, was arrested Thursday afternoon and booked into the Sequoyah County Jail for child abuse by injuries. Other allegations are expected. Skyla Nicole Harris, 21, was being held without bond Thursday after her arrest. A male suspect in the same case, Luke McKinley Walden, 26, was arrested Saturday and booked into the county jail on assault charges after Harris took the child to Sequoyah Memorial Hospital in Sallisaw on Friday, and the hospital contacted Sallisaw police. Walden was released Tuesday on a $100,000 bond. The child is in the custody of the Oklahoma Department of Human Services. Sallisaw Police Chief Terry Franklin said Sallisaw police and the Sequoyah County Sheriff's Office are joining forces to investigate the case and were doing so Thursday afternoon. "We are trying to get to the bottom of this and get some answers," Franklin said. Franklin said the sheriff's investigators are assisting with the case because the suspects in the case live outside city limits. Sallisaw police and sheriff's deputies found Walden Friday and interrogated him at the Sallisaw Police Department. According to the police report, Walden told the investigators that he had been strung out on meth for months and had whipped the baby too much and too hard, causing the injuries. He said he hit the baby so many times he could not count and that the bled from the whippings. Walden also admitted to the cigarette burns, and kicking the child and pushing him into a space heater. Walden, according to the report, stated, "I should burn in hell." 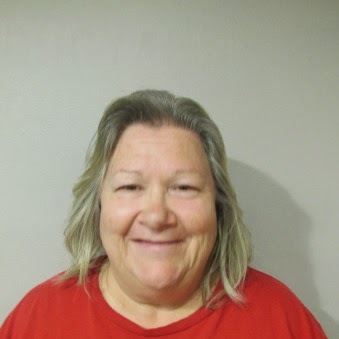 According to court records the child's mother, Harris, and his grandmother filed for protective orders against Walden Tuesday in Sequoyah County District Court. Walden and Harris both told investigators that the child had been in Texas with Walden for the past three months, and had just returned one or two weeks ago. It was not in the report why the child was with Walden. Stay tuned to KXMX for the latest news or visit www.kxmx.com. 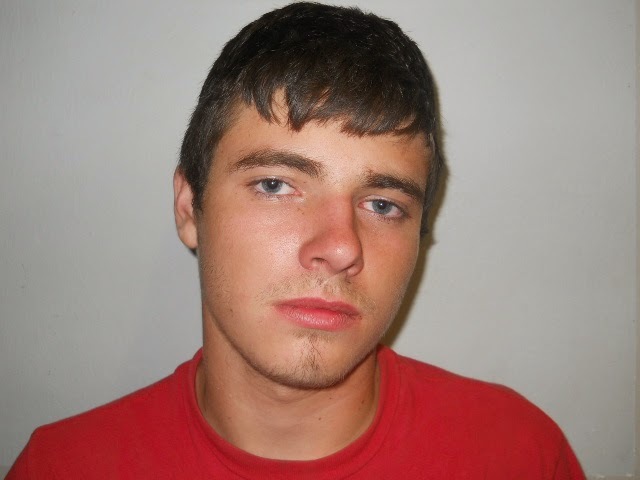 Arty Allen Farris, 19, of Marble City was released from the Sequoyah County Detention Center Tuesday on a $25,000 bond. 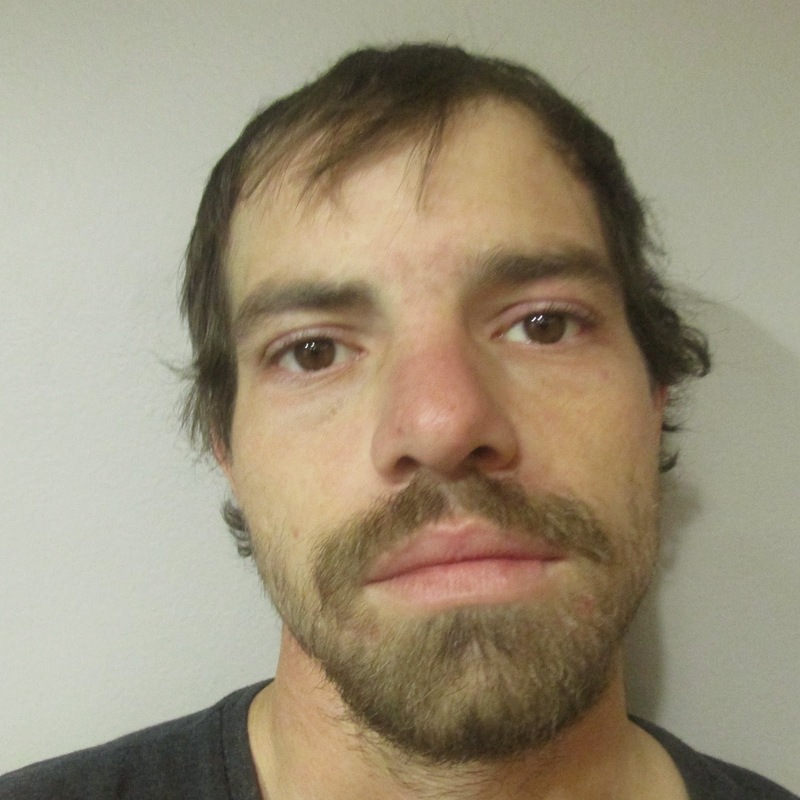 Farris was arrested April 5 and booked into the county jail after firefighters, battling a blaze at Farris' Marble City home, found a body in the house. Farris was arrested that same day and booked into jail on suspicion of murder, two counts of arson, and one count of endangering emergency personnel. The case is being investigated by the sheriff's office, the state fire marshal and the Oklahoma State Bureau of Investigation. Formal charges are expected to be filed next week Jack Thorp, First Assistant District Attorney based in Tahlequah, said. Thorp is handling the case. The body was identified last week by the state medical examiner as Jason Stone, 22. Although the medical examiner has not submitted a report on the cause of death to the investigating agencies, it is expected to be reported as caused by smoke and heat inhalation. A female in the house was treated for burns in a Tulsa hospital after escaping the blaze by jumping through a window. A third man was reported to have been in the house but uninjured. Stay tuned to KXMX for all the latest news, or visit www.kxmx.com. 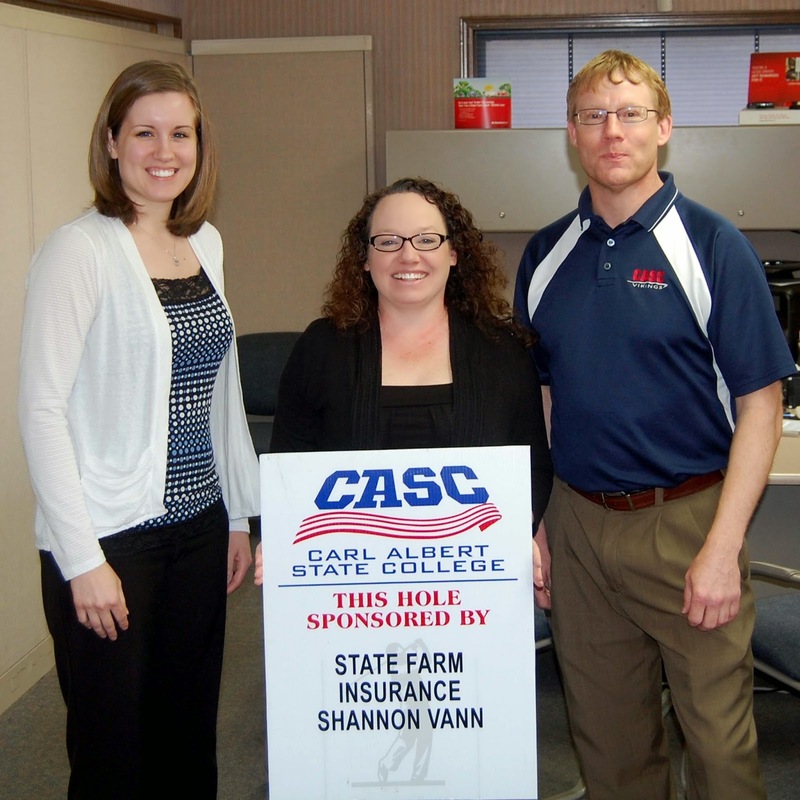 Vann Insurance of Sallisaw will be sponsoring a hole at the 12th annual Carl Albert State College Scholarship Golf Tournament on May 10 at Shadow Creek Country Club in Sallisaw. At the announcement, above, are, from the left, Candace Emerson, Cheryl Vann, and Paul Marshal. Registration for the four-person team, 18-hole scramble will be at 8 a.m. and tee-off is at 9 a.m. The entry fee is $50 per person or $200 per team. The cost includes cart, green fees, lunch, beverages and a goodie bag. The first place team will win $600, the second place team will receive $460 and a wild-card drawing will choose the third-place team which will receive $300. Prizes will also be awarded for longest putt, longest drive, closest to the pin, and for holes in one on par 3 holes. For information contact Paul Marshall at 918-776-9242. Stay tuned to KXMX for the latest news or visit www.kxmx.com. Two candidates for offices with local connections may not be on this year's ballots. One, Tom Brennan, 42, of Poteau, who filed as a Democrat to run against the state senate incumbent, Mark Allen, 65, a Republican from Spiro, withdrew from the state senate race Monday. Bryan Dean, spokesman for the State Election Board, said a withdrawing candidate does not have to list a reason. The withdrawing candidate, however, does not get his or her $200 filing fee back. Another candidate, Ann Weaver, 66, a Democrat from Muldrow, will still face off against Allen in the Nov. 4 general election. In another race, for District 15 Judge, Office 3, the incumbent, Jeff Payton, 50, of Stilwell is challenging the eligibility of his opponent, Josiah Stone, 53. On his filing Stone lists his residence at a rural Stilwell address. At one time in the past he had a rural Muldrow address. In his challenge, filed Monday, Judge Payton argues that Stone does not have the four years experience as an attorney or a judge, as required by law for the post; is not a registered voter; was convicted of a misdemeanor, in 2011 in an Oklahoma County case; and did not file with his full name, which is Joseph Josiah Stone. According to court records, Stone was convicted of filing a false claim for victim's compensation in a jury trial on Sept. 1, 2011. Dean explained that candidates must be at least 15 years past a misdemeanor conviction in order to file for an elected office in Oklahoma. In 2009, Stone told the media he was being threatened by residents at Elohim City in northeast Sequoyah County, and promised to run against Payton, who, Stone said, would do nothing about his allegations. Dean said the three-member Oklahoma Election Board will meet April 21 in Oklahoma City to review challenges to candidates. Stay tuned to KXMX for the latest news, or visit www.kxmx.com. The filing period for local, state and U.S. offices concluded at 5 p.m. Friday. All county positions have unopposed incumbents except for the County Assessor office. However, several are seeking the state senate seat now held by Mark Allen of Spiro. The district attorney’s post, which serves four counties, will also be contested. The contest period, to challenge any candidate and which rarely occurs, ends at 5 p.m. Tuesday. -County Assessor: Donna Graham, 63, of Sallisaw, the incumbent, Democrat. She has drawn an opponent, Randy Byrd, 54, of Sallisaw filed as a Republican. This race will be decided in the Nov. 4 general election. -County Treasurer: Tricia Yates, 57, of Sallisaw, the incumbent and a Democrat (unopposed). -County Commissioner District 1: Ray Watts, 45, of Muldrow, the incumbent, Democrat (unopposed). -County Commissioner District 3: Jim Rogers, 54, of Sallisaw, Democrat (unopposed). -State Representative: John Bennett, 39, of Sallisaw, Republican (unopposed). -State Representative: Ed Cannaday, 73, of Porum, Democrat, (unopposed). -District 27 District Attorney: Brian Kuester, 49, of Coweta, Republican; and Anne Mize, 42, of Broken Arrow, Republican. -District Judge. No. 15: Jeff Payton, 50, of Stilwell, incumbent; and Josiah Stone, 53, of Stilwell. -Associate District Judge: Kyle Waters, 36, of Sallisaw and Matt Orendorff, 32, of Sallisaw. -Governor: Mary Fallin, 59, of Oklahoma City, Republican and the incumbent; Chad Moody, 46, of Oklahoma City, Republican; Dax Ewbank, 38, of Guthrie; Joe Dorman, 43, of Rush Springs, Democrat; Richard Prawdzienski, 66, of Edmond, independent, Joe Sills, 34, Oklahoma City, independent; and Kimberly Willis, 51, of Oklahoma City, independent. -Lieutenant Governor: Todd Lamb, 42, of Oklahoma City, Republican and the incumbent; and Cathy Cummings, 52, of Oklahoma City, Democrat. -State Auditor and Inspector: Gary A. Jones, 59, of Cache, Republican and the incumbent (unopposed). -Attorney General: Scott Pruitt, 45, of Tulsa, Republican and incumbent (unopposed). -State Treasurer: Ken Miller, 47, of Edmond, Republican and incumbent (unopposed). -Superintendent of Public Instruction: Janet Barresi, 62, of Oklahoma City, Republican and incumbent; Joy Hofmeister, 49, of Tulsa, Republican; Brian Kelly, 50, of Edmond, Republican; Jack Herron Jr. 68, of Norman, Democrat; John Cox, 50, of Hulbert, Democrat; Freda Deskin, 65, of Edmond; and Ivan Holmes, 77, of Oklahoma City, Democrat. -Commissioner of Labor: Mark Costello, 58, of Edmond, Republican and incumbent; and Mike Workman, 63, of Tulsa, Democrat. -Insurance Commissioner: John Doak, 51, of Tulsa, Republican and incumbent; and Bill Viner, 61, of Moore. -U.S. Senator: James Inhofe, 79, of Tulsa, Republican and incumbent; D. Jean McBride-Samuels, 59, of Jenks, Republican; Erick Paul Wyatt, 35, of Norman, Republican; Evelyn L. Rogers, 61, of Tulsa, Republican; Ray Moye, 58, of Yukon, Republican; Matt Silverstein, 33, Democrat; Ray Woods, 78, of Fairview, independent; Aaron Delozier, 30, of Wichita Falls, Texas; and Joan Farr, 58, of Broken Arrow, independent. -U.S. 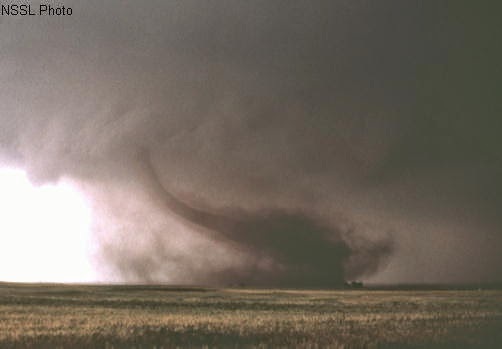 Senator (unexpired term of Tom Coburn of Muskogee): Connie Johnson, 61, of Oklahoma City, Democrat; Patrick Michael Hayes, 39, Anadarko, Democrat; Jim Rogers, 79, Midwest City, Democrat; and Jason Weger, 31, of Norman, Republican; Kevin Crow, 46, of Chickasha, Republican; Eric C. McCray, 33, of Tulsa, Republican; T.W. Shannon, 36, of Lawton, Republican; Randy Brogdon, 60, Owasso, Republican; James Lankford, 46, of Edmond, Republican; Andy Craig, 41, of Broken Arrow, Republican; and Mark T. Beard, 54, of Oklahoma City, independent. -Representative District 2: Markwayne Mullin, 36, of Westville, Republican, and Darrel Robertson, 64, of Jay, Republican. 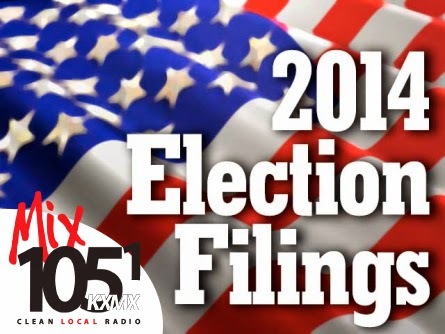 Tune in to KXMX 105.1 for all the latest election news, or visit online at www.kxmx.com. At approximately 3:45pm area law enforcement officials including the Oklahoma Highway Patrol, Sequoyah County Sheriff's Department and the Vian Police Department were called to the scene of a semi truck that had caught fire in the East bound lane of Interstate 40 at the Vian exit. Reports indicate the semi was hauling Army explosives. The Vian Fire Department was called out immediately and did an outstanding job extinguishing the fire under dangerous circumstances. The loud explosions heard in the area are believed to be related to the vehicle's tires blowing out and not from weapons explosions. The vehicle is located on or near the bridge overpass of Highway 82 and Interstate 40 and is blocking the interstate at this time. Traffic is being diverted off the interstate onto the east bound off ramp at Vian and immediately directed back onto the east bound on ramp. The status of the driver is unknown at this time. A non-custodial mother, who allegedly kidnapped her 3-year-old daughter, has been jailed, and faces a kidnapping charge. Authorities stated that due to the quick response of The MIX 105.1's listeners that they were able to apprehend the suspect so quickly. 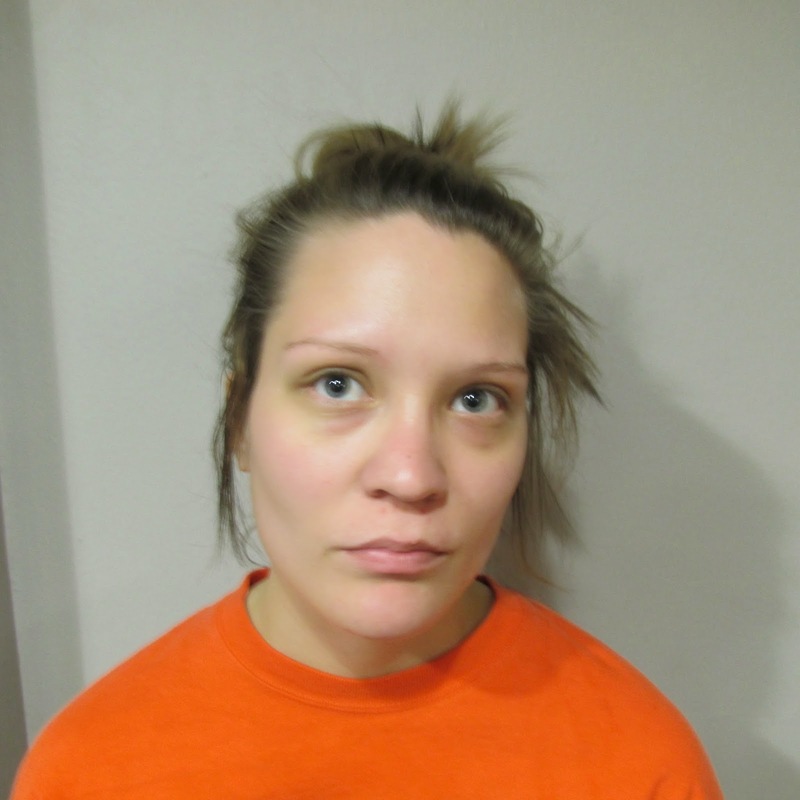 Jewel Ann Harrison, 27, is in the Sequoyah County Detention Center in Sallisaw where she was booked Thursday on the kidnapping charge. Roland Police Chief Tommy Sessums issued a BOLO, or be on the lookout for, Thursday afternoon for Harrison and the girl, after the child's father, who had sole custody, reported her missing. Sessums said the child is now safe and in the custody of her grandparents. 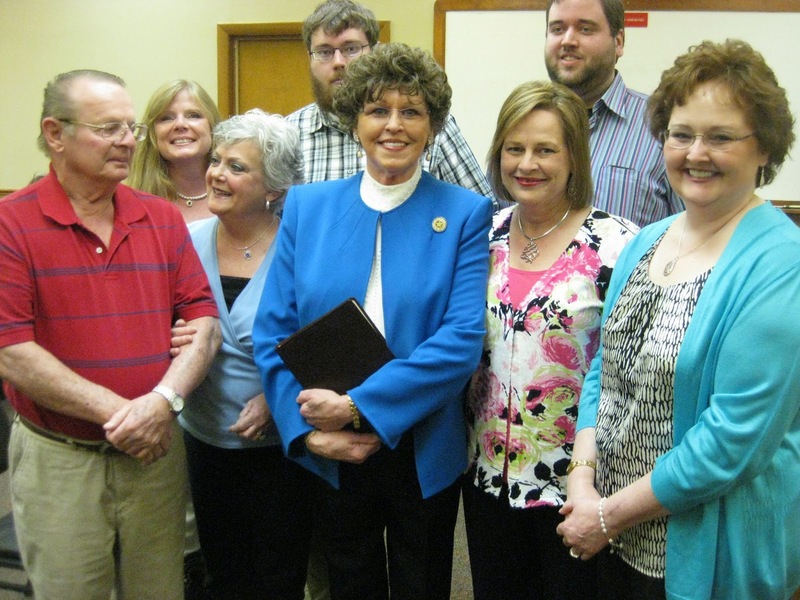 Julie Ferguson, center, holds her Bible on which she took the Oath of Office as the first female mayor of Sallisaw. She took the oath on Thursday evening at the city council chambers. With her are, from the left, her brother-in-law D.W. Ferguson; Sue Ellen Ferguson; Jo Ann Ferguson; Julie Ferguson's grandsons, Erick and Jason Minden; and her two daughters, Nita Minden and Dr. Teri Ferguson. The newly installed city officials take over their duties at noon on Monday, April 14. Stay tuned to KXMX for all the local news or visit kxmx.com. 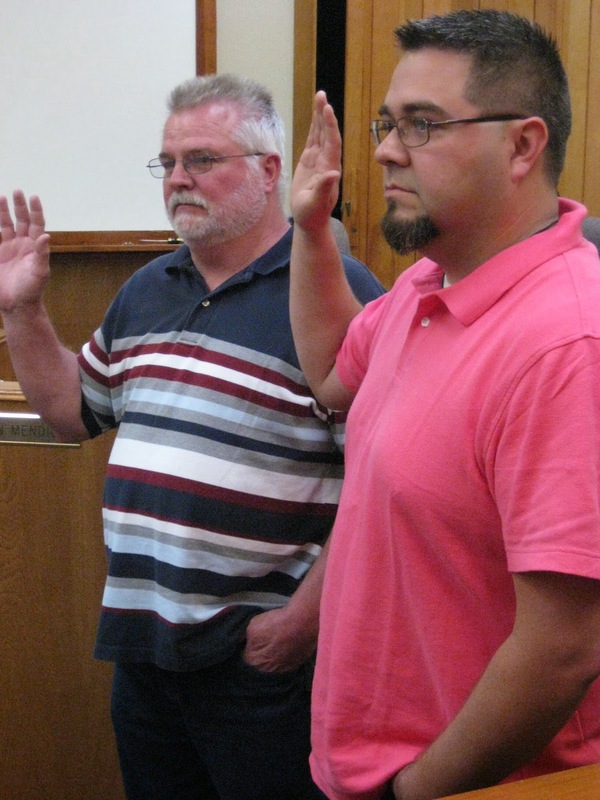 Ronnie Lowe, Sallisaw City Commissioner for Ward 1, and Julien Mendiola, Sallisaw City Commissioner Ward 3, take the Oath of Office at a special city meeting held Thursday. The two commissioners were unopposed in the recent city elections, and retained in their posts. 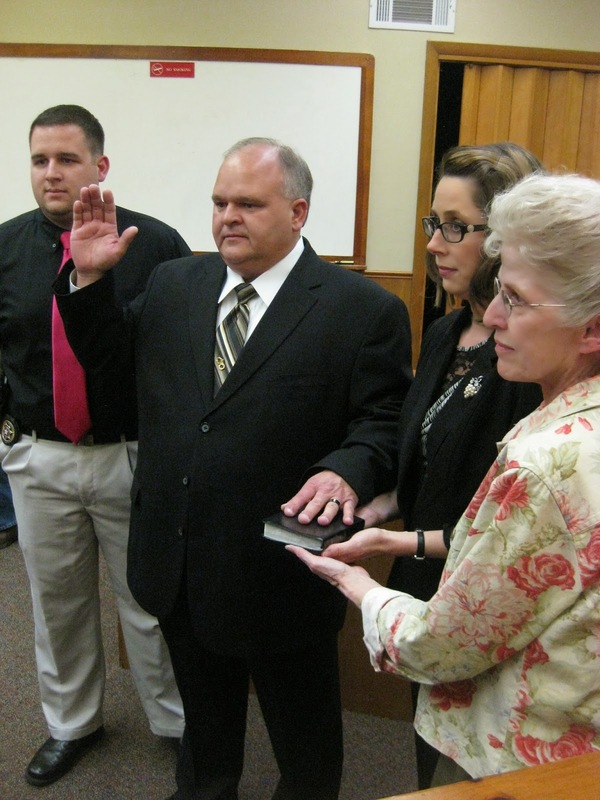 Sallisaw's new police chief, Terry Franklin, takes the Oath of Office at a special city meeting held Thursday evening. With him are his son, Chris, left, his wife, Colleen, and her mother, Janet Chance, right. Franklin won the post after defeating his opponent Sandy Girdner in a second election, held because the two candidates tied for votes in the regular city election. For more news stories visit our website at kxmx.com. We have just received notification from authorities that the 3 year old girl that was involved in the possible child abduction earlier today has now been reported safe. Listeners may recall our earlier live broadcasts and reports of the issuance of a BOLO (Be On The Look Out) report for a 3 year old child that had possibly been abducted from the Roland area. The child was believed to have been in Sallisaw in the company of her non-custodial mother, Jewel Harrison. No other details are being released at this time. The filing period for U.S., state and county political offices began Wednesday with several filing. On the county level four offices will be up for election. They are Assessor, Treasurer, Commissioner District 1 and Commissioner District 3. As of 2 p.m. Wednesday the following had filed to seek election. - County Assessor: Donna Graham, 63, of Sallisaw, the incumbent, as a Democrat. She has drawn an opponent, Ronald Jay Byrd, 54, of Sallisaw filed as a Republican. - County Treasurer: No filings as of 2 p.m. Wednesday. The incumbent is Tricia Yates, a Democrat. - County Commissioner District 1: Ray Watts, 45, of Muldrow, the incumbent, as a Democrat. - County Commissioner District 3: Jim Rogers, 54, of Sallisaw, the incumbent, as a Democrat. On the state level, three local candidates have filed for office. They are all incumbents. State Senator Mark Allen, 65, of Spiro who is a Republican, State Rep. John Bennett, 39, of Sallisaw, who is a Republican; and State Rep. Ed Cannaday, 73, of Porum, who is a Democrat. All three had to file with the state election board in Oklahoma City, and , as of 3 p.m. Wednesday, none had drawn an opponent. Also filing with the state were Brian Kuester, 49, of Coweta, the District 27 District Attorney incumbent, who is a Republican, and District Judge Jeff Payton, 50, of Stilwell has filed to retain his post as judge for District 15. Filing to run for associate district judge are Kyle Waters, 36, of Sallisaw and Matt Orendorff, 32, of Sallisaw. The incumbent is Associate District Judge Dennis Sprouse. Other state and federal offices open are governor, lieutenant governor, state auditor and inspector, attorney general, state treasurer, superintendent of public instruction, commissioner of labor, insurance commissioner, two U.S. senate seats (one for the unexpired term of Tom Coburn of Muskogee who is resigning due to health reasons), and U.S. representative district2. The filing period remains open until 5 p.m. Friday. The primary election will be June 24, the runoff election, if needed, will be Aug. 26, and the general election will be Nov. 4. For more local news stories visit us at www.kxmx.com. 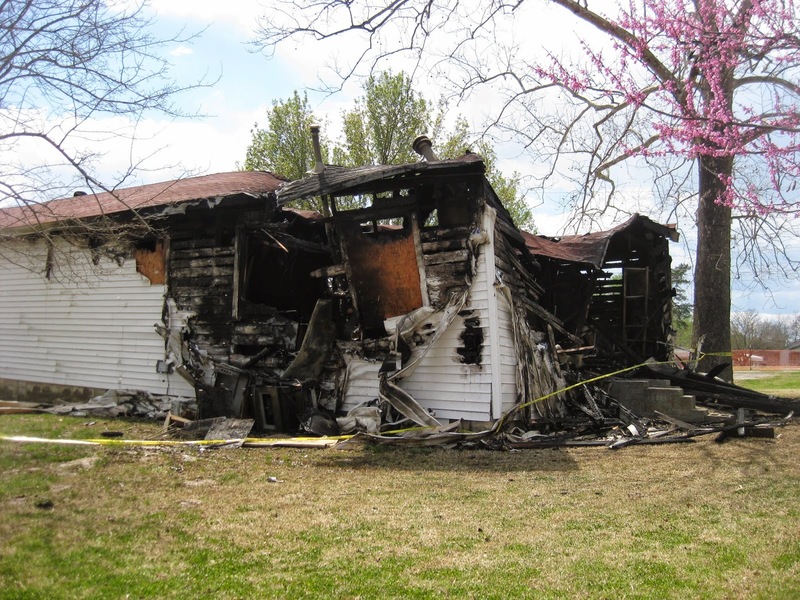 A body was discovered today, April 7th, in a Gans, OK residence that burned in late March, according to the Sequoyah County Sheriff's office. Law enforcement agencies are currently waiting for a search warrant and a crime scene unit. Foul play has not been ruled out at this time. This is the second burned body that has been discovered in Sequoyah County in the last three days. The incidents do not appear to be related. UPDATED 9:40 pm: According to additional information obtained from authorities the body was discovered by the next door neighbor to the burned residence. The house fire had occurred on March 25, 2014. Both the OSBI and the State Fire Marshal were contacted. When authorities entered the home they discovered a burned, decomposing body lying on the floor of a back bedroom, according to Sequoyah County Sheriff Ron Lockhart. The body was taken to the Medical Examiner's office in Tulsa for an autopsy to determine the cause of death. Sheriff Lockhart stated that authorities are investigating a report of a male subject that was seen fleeing the residence after a fight that had occurred one hour before the fire was reported. Gans police investigated the fight but have been unable to locate the subject that fled. A 19-year-old Marble City man remains in the Sequoyah County jail where he was booked late Saturday on a murder charge, two counts of arson and endangering emergency personnel. Sheriff Ron Lockhart said Arty Allen Farris was arrested late Saturday after his story about a fire at his home was suspicious. The body of an unidentified victim was found in the home, and a female found outside the burning house was transported to Hillcrest Medical Center in Tulsa where she is being treated for burns. It was reported that four people lived in the house. Lockhart said foul play is suspected, but details will not be released until investigators receive the medical examiner's report. The case is being investigated by the sheriff's office, Oklahoma State Bureau of Investigation agents and the State Fire Marshal's Office. The Marble City Volunteer Fire Department was dispatched at about 6:10 a.m.Saturday to the fire, and reported they were told a person was still in the home, but the structure was engulfed by that time and they could not reach the victim. The body was found after the blaze was extinguished and sent to the medical examiner. The Marble City Police Department, Sequoyah County Sheriff's Department, OSBI, and the Oklahoma State Fire Marshal's Office have been investigating a house fire in the city limits of Marble City which occurred at 6 am this morning. The body of a male subject was found inside the residence. The body has been sent to the medical examiner's office for cause of death and positive identification. The crime scene evidence collected has lead investigators to suspect foul play. Authorities do have a person of interest and are currently conducting interviews, according to Sequoyah County Sheriff Ron Lockhart. Updated 9:58 pm: An arrest has been made in the death of the victim found today in a burned house in Marble City. 19 year old Arty Farris, who resided in the home, has been arrested for murder and arson. According to Sheriff Ron Lockhart Farris is being held in the Sequoyah County Jail. In addition, there was a 19 year old female in the house when it caught fire. She was able to jump from a window. She was life flighted to a burn center in Tulsa. Starting Monday, April 7th, at 2:00pm, THE MIX 105.1 will have a new feature show that you won't want to miss. 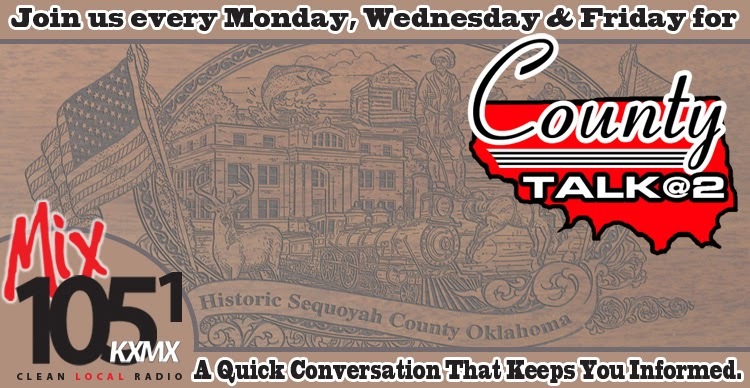 Join Darren and Kyle for County Talk at 2 each Monday, Wednesday and Friday at 2pm as they sit down with area officials, politicians, community leaders and others with information that impacts our daily lives. County Talk at 2 will be a quick conversation that keeps you informed on local issues. 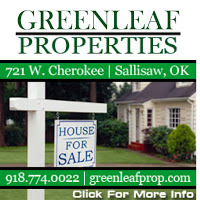 Guests the first week will be Monday-Outgoing Sallisaw Mayor Shannon Vann, Wednesday-Newly Elected Sallisaw Mayor Julie Ferguson and Friday-Sallisaw Public Schools Superintendent Scott Farmer. Future guests will include people from the entire Sequoyah County area. Don't miss it....County Talk at 2. County emergency services will be using new technology to warn citizens of impending emergencies. Steve Rutherford, Sequoyah County Emergency Management director, said, “The Nixle Community Information Service allows us to create and publish messages to be delivered to subscribed residents instantly via cell phone text message and email.” Notifications can also be accessed on line at Nixle’s website. Messages may include severe weather warnings and other emergencies as well as relevant safety and community event information. The service is easy to sign up for. Go to www.nixle.com and register for the service, which is secure, reliable and easy to use. Subscribers can decide which local agencies they wish to hear from, and how alerts are received, by email, text message or over the web. When citizens receive information via Nixle, they know it can be trusted, Rutherford said. $1.3 Million Dollars Less-That's the cutback in funding Sallisaw Public Schools must deal with and why 120 administrators, teachers, staff, students and parents from Sallisaw attended a rally at the state capitol in Oklahoma City on Monday. Representatives from several other county schools attended the rally as well. Scott Farmer, Sallisaw Schools Superintendent, said the school system's budget is $1.3 million less this year than it was in 2009. That has resulted in cutbacks in staff and other areas. Farmer said no school employee has been fired because of the cutback in funding but the system has eliminated 15 positions through retirement. The decreased funding is hurting rural schools, such as Sallisaw, the most, he said. Overall, state funding for education is about $200 million less than it was in 2009, but the state's schools have about 40,000 more students. Many at the rally flew banners and held signs that read "678,000 Reasons To Fund Education". 678,000 is the number of students in the state's public school system. Farmer said it was estimated that between 25,000 and 30,000 attended the rally, sponsored by the Oklahoma Education Coalition. "It's time we took education seriously," Farmer said and he urged everyone to ask State Rep. John Bennett and State Senator Mark Allen to support education. Bennett can be emailed at john.bennett@okhouse.gov. Allen is at allen@okstate.gov. Farmer will be on our new show here at THE MIX 105.1 called County Talk at 2:00 on Friday, April 11 discussing how to keep Sallisaw Schools funded. 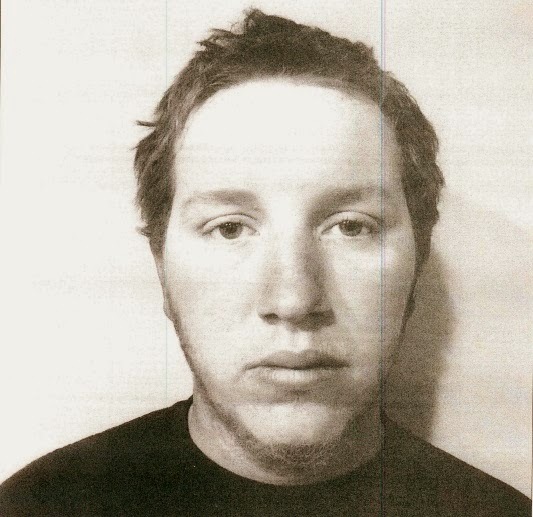 In a story that we brought you first, Alexander Turner, 26, of Fort Smith, Arkansas has been arrested today on charges of child abuse by the Sequoyah County Sheriff's Department. On Sunday night, March 30, the Sequoyah County Sheriff's Department were called to Mercy Hospital in Fort Smith regarding a possible case of child abuse. The incident occurred in Moffett at the home of the child's mother, Morgan Crow, on either Friday or Saturday night. The 7 month old girl was burned on the face and scalp from scalding water in the kitchen sink. Medical treatment was not sought for the child until Sunday night. After questioning of Crow she was arrested on charges of failure to protect. 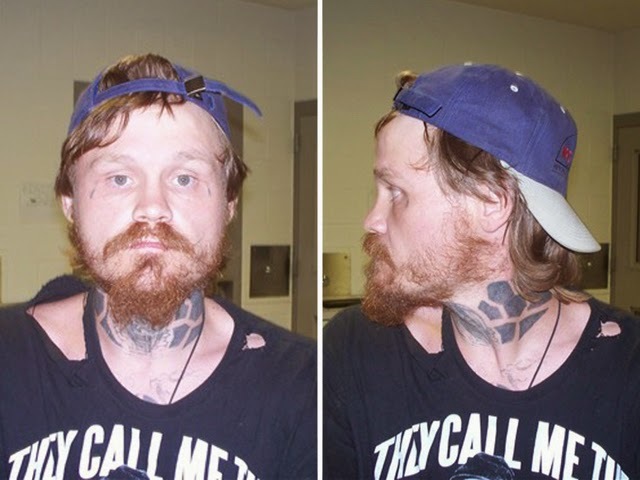 After locating and interviewing Turner he was arrested on charges of child abuse and is being held in the Sequoyah County Jail on $100,000 bond. Turner has a prior conviction out of Sebastian County for 2nd degree battery of his own children in 2013.